 A lively insider's look at life on the Seine from seasoned Associated Press correspondent Rosenblum (Who Stole the News?, 1993, etc.). When Rosenblum finds himself kicked out of his apartment on the Ile Saint-Louis, he buys a houseboat and explores the river that harbors France's soul. He begins at the source in Burgundy, where water wells up unspectacularly from three cracks among the remains of a Gallo-Roman temple, and ends at the mouth at Le Havre, where the Germans made a last stand in 1944. Along the way, he offers history as far back as the Paleocene period when the bed of the Seine was the floor of a shallow inland sea, investigates river towns like Giverny, which inspired Monet to realize those radiant panels of water lilies, laments pollution by nuclear power plants that generate 75 percent of France's electricity, and explains the economic evolution of a waterway that once flourished as mom-and- pop-run barges busily transported freight only to lose out when state-owned rails and roads undercut rates. Peppered throughout are anecdotal asides: a sampling of items that float by his launch in one half-hour period includes ``one mattress, countless Styrofoam containers, a bloated pig, several condoms, dead fish, live ducks, a television set, someone's jacket, someone else's trousers, many people's lunch.'' He also presents an astounding collection of river dwellers that makes one wonder ``if the Seine manufactures characters or merely attracts them.'' And despite his obvious Francophile tendencies, he recognizes that the homeless huddling in camps under the bridges represent ``the flotsam of a society headed for trouble.'' 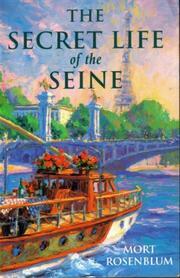 Rosenblum's prose brilliantly captures the spirit of the Seine--the name originates from the Gallic Sequana, meaning twisting or tranquil. Alternating romantic and acerbic tones inspire admiration, if not always envy, for a historically revered culture.